Another week, another four gigs – and that means baking! I’ve gone off cupcakes a bit lately. It’s such a performance to make and ice them, and I’ve been really pushed for time. I made another batch of choc chip cookies for the Shadow Orchestra gig on Tuesday (more of that later…), seeing as the ones I whipped up for our Favela Chic gig vanished in a matter of seconds. Here’s the recipe, adapted and anglicised from Dorrie Greenspan’s Baking: From My Home to Yours. Beat the butter in a freestanding mixer for a few minutes (or you could do it by hand the hard way…), then cream in both the brown and caster sugar until very light and fluffy. This takes ages. Briefly beat in the vanilla extract, then the beaten eggs, a little at a time. Mix the bicarb and salt into the flour, then beat into the wet mixture in three batches. Son’t overmix – they just need to be combined. Stir in the choc chips and fudge chunks, if using. Line baking sheets with non-stick liner, or grease them really well. Put dollops of the mixture (roughly a dessert-spoonful) onto the baking sheets, spaced well apart. I get about 8 per sheet, which makes cookies that are roughly 2 and a half inches in diameter. Cook until golden brown and more darkly browned at the edges – probably around 10-12 minutes but keep an eye on them. Take the baking sheet out of the oven, wait a few minutes for the cookies to firm up, then transfer onto a wire rack to cool. Give out to hungry fans. Brilliant, Kat, my pains au chocolat didn’t look much like pains au chocolat, so I might have to try these next. 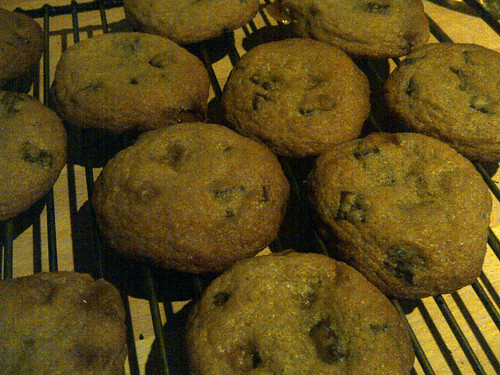 I’ve rarely seen chocolate chip recipes since leaving North America; and these look extremely authentic. I have a set of measuring cups, but I actually prefer to use weights when I bake, so I weighed everything out as I was going along. These cookies were amazing – crisp at the edges and fantastically chewy in the middle. I had to hide them from my boyfriend or he’d have eaten them all before they got to the gig venue!